The holiday season brings out the good in most people, but sometimes the not so good in others. A recent event brought out both actions. On Nov. 16, a woman stole a donation jar filled with money earmarked for two Rockford-based charitable organizations. The theft at the Treasures Galore Resale Shop in Rockford, reported by the Rockford Scanner, prompted a man to donate $300 dollars from his own pocket. The anonymous donor wore a Steiner Electric t-shirt. While we do not know if he was a Steiner employee, customer, or just someone who ended up with a Steiner shirt, we applaud him for his generosity and encourage others to learn more about the organizations to whom the donated money was earmarked: the Rockford Rescue Mission and The Carpenters Place. The Rockford Rescue Mission provides assistance to the homeless, near-homeless, addicted, and the working poor in the Rock River Valley. Each month, the Mission provides nearly 142,000 meals and 50,000 nights of lodging for area men, women, and children. To learn more about this group, visit www.rockfordrescuemission.org. The Carpenters Place provides “the tools necessary for rebuilding the lives of the homeless” including necessities such as shower facilities, secure storage for their belongings, and a mailing address. In addition, case management teams work one-on-one with those in need to develop a personal Life Recovery Plan. For more information, visit www.carpentersplace.org. 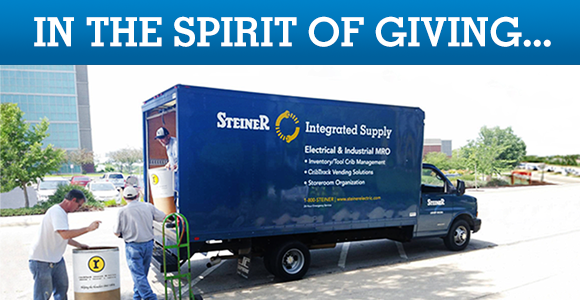 In the same spirit of giving, Steiner Electric has matched the donation made by this generous individual.